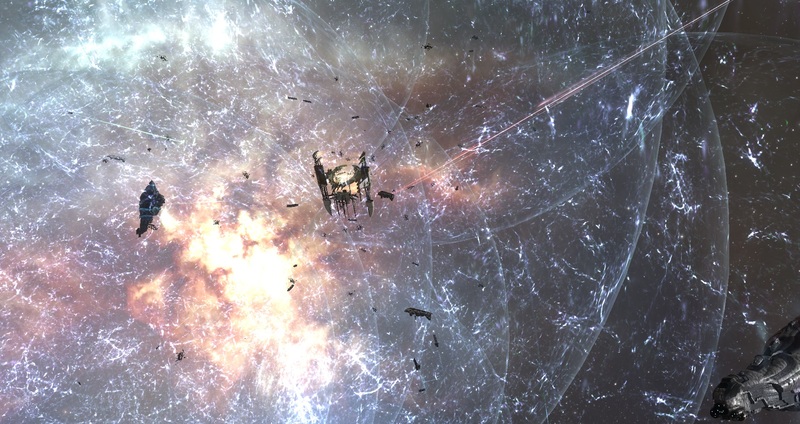 CHA2-Q in Fountain saw a fight over several tackled Rorqual industrial capital ships as a joint Snuffed Out [B B C]\Project.Mayhem. [16-13]\WAFFLES. [N0MAD] Proteus strategic cruiser fleet attempted to destroy the ships. The-Culture [-T C-] retaliated, bringing a Rattlesnake battleship fleet and later on deploying super capitals to the field. With super capitals on the grid, the Proteus fleet called for reinforcements which it received in the form of a Goonswarm Federation [CONDI] Proteus fleet as well as a few smaller gangs. 36N-HZ and U-QVWD in Catch saw several violent clashes between different gangs. From a Goonswarm Federation Jackdaw tactical destroyer fleet, a Providence Bloc Hurricane battlecruiser fleet, a Test Alliance Please Ignore [TEST] Osprey Navy Issue cruiser gang, a Phoenix Federation (PF) Rupture cruiser fleet and more. TRKN-L in Tribute saw a Pandemic Legion [-10.0] titan destroyed by Out of Sight. [OOS] and Red Menace (RMC) coalition joint Rattlesnake fleet with dreadnought support. 24/3 The Initiative. versus Northern Coalition. Arittant in Solitude saw Northern Coalition. [NC] and The Initiative. [INIT.] clash over a tower in the system. Both sides fielded Machariel battleship fleets. AU2V-J in The Kalevala Expanse saw Therabois defend an astrahus citadel from the Drone Regions Federation (DRF) forces with the help of allies. DRF brought a Machariel fleet against Therabois’ Cerberus heavy assault cruiser fleet supported by Bombers Bar stealth bomber squadrons and a Proteus fleet provided by Shadow Cartel [SHWDC] and Did he say Jump [JMP-N]. EA-HSA in Immensea saw PF forces attempt to remove a Pandemic Legion engineering complex with the help of Tactical Supremacy [TIKLE] and Dangerous Voltage [DV]. The two parties fielded Tengu strategic cruiser fleets against Pandemic Legion’s combat carrier fleet. The battle rapidly devolved into a brutal capital brawl as the two sides dropped dreadnoughts on each other. 25/3 The Initiative. versus Mercenary Coalition and Northern Coalition. 2X-PQG in Syndicate saw The Initiative. attempt to defend a tower from being reinforced by Mercenary Coalition [MC]. The Initiative. brought a Rattlesnake fleet versus Mercenary Coalition’s Machariel fleet which was further supported by a dreadnought squadron. As the two opponents fought, Northern Coalition. formed its own Machariel fleet and once Mercenary Coalition left the field came in to confront The Initiative..
1M7-RK in Cobalt Edge saw a tackled Hel super carrier spark a battle as Project.Mayhem. Orthrus cruiser fleet, reinforced by Snuffed Out Tengu strategic cruisers, confronted DRF forces which brought an entire super carrier squadron to the field. Project.Mayhem.’s fleet was quickly joined by a Hard Knocks Citizens [HKRAB] super carrier squadron and an Out of Sight. Cerberus fleet which aided it against the DRF.